Atsara was an acquired taste for me. Growing up, I distinctly remember not liking atsara and would push it off to the side of my plate so it would not touch my (Philippine) chicken barbecue. Meanwhile, my father would be making oohs and aahs, in a manlier way of course, over atsara. I couldn't understand the ado about some scraggly pieces of sweet-sour vegetables. Who knows when the tide turned, eh? Now, I can't get enough of atsara. It is a perfect condiment to grilled meats and fishes. When we have our Filipino food fix at Rekados, I'd gobble up the atsara on top of each dish and ask for more. We never thought of making atsara ourselves until Starry, Starry Night. It was the most opportune time to learn how to make a good atsara. It's actually very easy as this is one of those quick pickles. One just has to get through the green papaya prep. 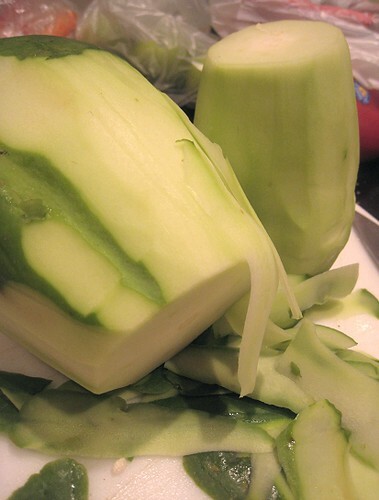 I peeled the green papayas, cut them in half and discarded the seeds. I like the cool, barely green color of these unripe ones. Oh, and the seeds? Still pearly white. 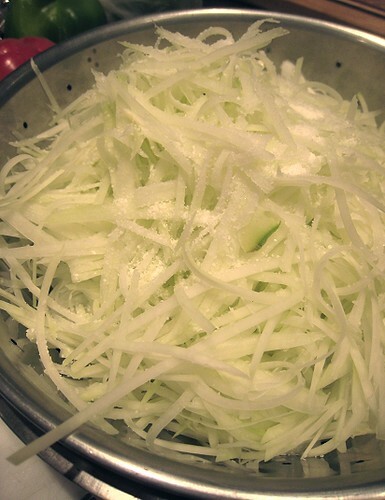 The shredded green papaya was salted and let to sit in a colander for about an hour. Then, I had to squeeze out the excess moisture. 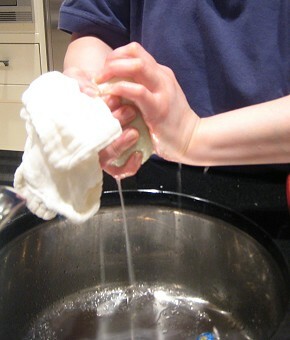 I leave the squeezing to TS because I know it's one of those tasks I cannot do very perfectly. We will have watery atsara if I were to do it. So, prudence being the better part of valour, better to delegate these sorts of tasks. To make the pickling solution, I heated some vinegar (I used either cane or coconut vinegar) with sugar and a tiny bit of salt, then added a garlic clove, thinly sliced ginger, and some black peppercorns. It only needed a little time on the heat, just to dissolve the sugar. I let this cool slightly. 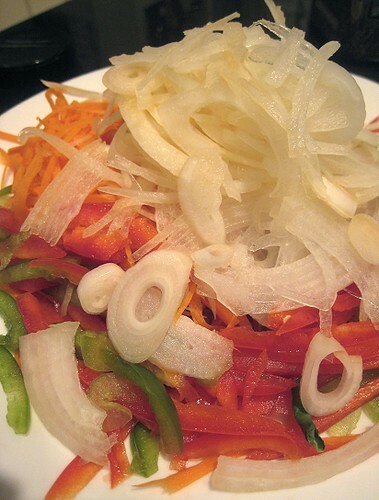 Other ingredients in the atsara were carrots, red and green bell peppers, and onions. All were sliced thinly. Actually, carrots in atsara sometimes look like flowers. I tried carving out the sides of the carrot so that I can slice them into flower shapes, but it was not to be. 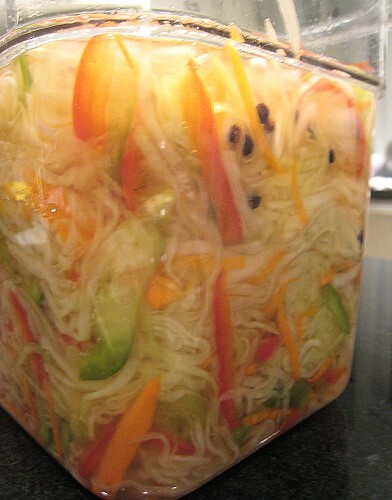 It was just a matter of adding the pickling solution to the green papaya and other vegetables, letting the mixture cool to room temperature (if still warm), putting it in the refrigerator, and waiting. I suggest waiting overnight. We didn't add raisins at first, thinking the atsara could forego it. We tasted it without, but JS wanted that, how would one describe it, well, raisin-y sweetness that sugar alone doesn't have. So we added a handful of raisins. The atsara was a hit! The whole container was pretty much devoured that very night. In fact, my mother has since requested atsara a few more times, but we just haven't gotten around to it. I guess I need to pick up a green papaya soon. Peel papaya. Cut open and discard the seeds. Shred the flesh using a vegetable shredder. Place in a colander and add the kosher salt. Toss. Let sit for about an hour. In the meantime, prep the other vegetables. Shred the carrot. "Julienne"/thinly slice the bell peppers and the onion. 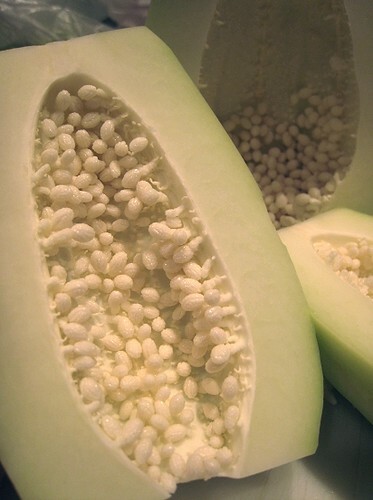 They should be similar in size and shape to the green papaya shreds. 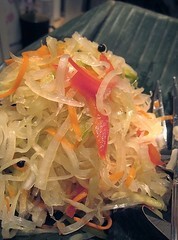 After the hour is up, squeeze green papaya shreds to get rid of excess moisture. Toss green papaya together with the prepped vegetables and raisins. In a small saucepan, heat the vinegar over low. 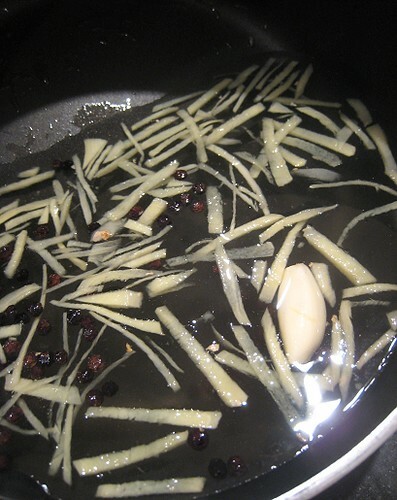 Add the sugar, salt, black peppercorns, garlic clove and thinly-sliced ginger. Heat until sugar and salt have dissolved. Let cool slightly (until only lukewarm). Pour over vegetables. Let cool to room temperature. Store in a container, cover tightly, and refrigerate overnight. Serve as a condiment to meat or fish dishes, especially grilled items. If you'd like to participate, see who's hosting next week. WHB is hosted this week by Anna of Anna's Cool Finds. Sounds delicious! I'd love to try this if I can find a green papaya. I love pickles and this seems very similar to VNese papaya salad. Well, if you add fish sauce, and shrimp or beef jerky anyway. Yummy-looking atsara! I never thought to put raisins, would try that. This would go great with inihaw na porkchop. I love green papaya salad, so I'm sure to love these pickles! Thanks for participating in WHB. Amazing! Crazy about any kind of pickled veggie or fruit - instantly makes my mouth water just thinking about it. Would I get cane or coconut vinegar in any Asian market? I'm intrigued. So interesting! I've had Thai green papaya salad. Is this at all similar to that? Our Asian supermarket almost always has papayas. Oh, brown sugar, eh? I guess the atsara becomes a tawny color? I also refused to add raisins at first, but as long as I don't actually eat them as part of the atsara, it's OK. Although, this is missing that fish-saucy/salty aspect of the papaya salad. Now I want ti make green papaya salad again. I just had one while dining out and it was no good at all. Oh, really? I really thought raisins were the standard! Yeah, I think the cane or coconut vinegar should be fairly accessible. Or, if not, then I think even just plain old white vinegar would be fine. Thanks! I think this is more sweet/tangy whereas Thai (or Vietnamese) Green Papaya Salad would also have those flavors as well as the depth and saltiness of fish sauce. So this is usually eaten as a condiment.